Dr. Pam Homan '81, executive director of the Center for Innovation and Entrepreneurship, speaks at the news conference announcing the Augustana Data Warehouse. Big data is coming to Augustana University. 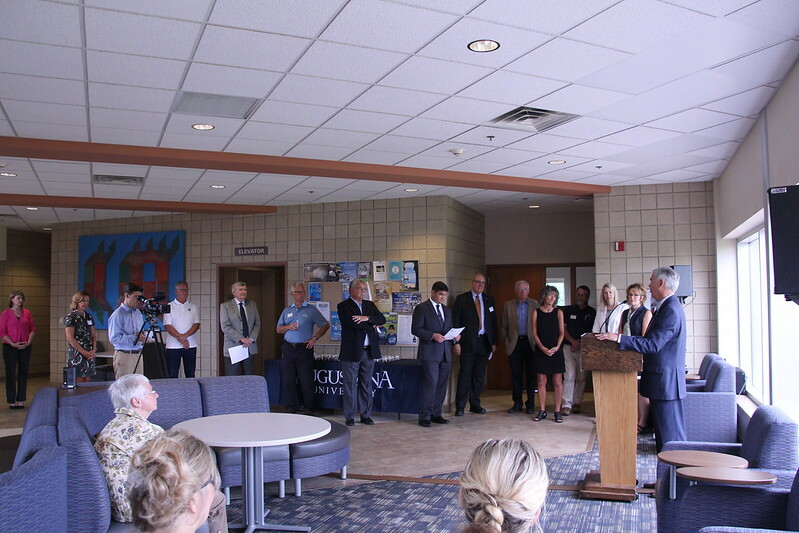 At a news conference Thursday morning, Augustana was announced as the home for a new central repository of workforce, economic vitality, social services, education and quality-of-life data for the Sioux Falls Metropolitan Statistical Area (MSA), a geographical, economic and social area defined for U.S. Census purposes. The Augustana University Data Warehouse was introduced by representatives from the University's Center for Innovation and Entrepreneurship, Sioux Falls Thrive, the city's departments of Community Development and Planning and Building Services, the Sioux Empire United Way, Sioux Falls Area Chamber of Commerce, Sioux Falls Development Foundation, Sioux Falls School District and Sioux Falls Area Community Foundation. Last year, with leadership from Sioux Falls Thrive, representatives from Augustana, city departments, the Sioux Falls School District and area nonprofits formed a group to analyze how data is reported, tracked and used. The group found that each day, employees of local government, nonprofit and commercial entities charged with maintaining public information websites, reporting news, writing grant proposals and developing marketing and business plans spent countless hours making phone inquiries and searching the internet to pinpoint demographic and socio-economic data about the Sioux Falls MSA. The result was lost productivity and, because the data wasn't centralized, a risk of inaccuracy. “It was time to ... look for a solution that could meet all of those needs," said Evan Nolte, Augustana Class of '65 and president of Sioux Falls Thrive. After identifying its design standards, the group endorsed development of the Augustana University Data Warehouse. The warehouse will hold two data hubs: a proprietary hub used for warehouse partners’ research projects and “OpenSiouxFalls,” a central repository of community indicators reflective of the workforce, economic vitality, social services, education, and quality of life of the Sioux Falls MSA. For Augustana, hosting the Data Warehouse builds additional capacity for scholarly, academic research opportunities for faculty and students. "Augustana is working every day to help build a better tomorrow here and around the globe. This project will help our community partners do the same," said Dr. Pam Homan '81, executive director of the Center for Innovation and Entrepreneurship. "In addition, this endeavor will give way to unmatched opportunities to engage in valuable, real-world research for our faculty and students." Development and two years’ maintenance costs will be shared by contributions from five founding partners — the Sioux Falls Area Chamber of Commerce, the City of Sioux Falls, Sioux Falls Development Foundation, Sioux Falls Thrive and the Sioux Empire United Way — and matched by Augustana University. Augustana will manage the project in accordance with direction from a council composed of the Warehouse’s founding partners. Beta testing of Phase I of the project is planned for later this summer. To learn more, contact the Augustana University Center for Innovation and Entrepreneurship.